Looking on their site it have solar powered light. Would that be legal here? It only has a rear coaster brake. Spotted an interesting bike yesterday. I've seen a couple of commuting bikes with drop bars & discs, and thought that was a pretty good combination. But I think they were both hybrid conversions, or Roadrats. The one last night was a Marin Toscana. Checking it out on the Marin website shows a v-brake model. But I wonder if this might be the way forward for commuters. Historical note: The first hybrids were such as the original Orbit Frontier, which was basically a rigid forked (there were no other types) MTB with randonneur bars. Kona Dew Drop also has discs and drop bars, very cheap too at the moment from Wiggle. I'm rather taken by the possibilities of hub gears, discs and a dynamo hub - a modded Alfine hubbed MTB would be a fantastic commuter. Ah yes. I sat next to a Dew Drop at the lights yesterday. Quite nicely set up. My ideal commuter would be pretty much as you describe, though I might prefer Rohloff or SRAM iMotion9 to an Alfine. 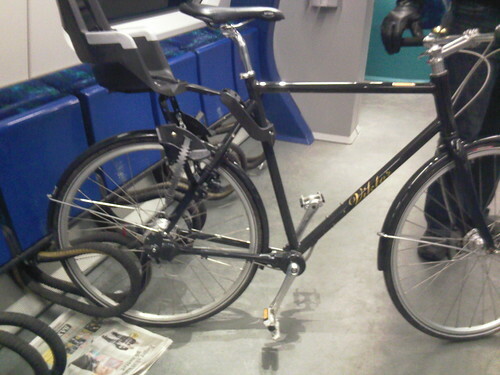 ...the Carrera Subway 8 from Halfords. Roller-braked Nexus, rather than Disk-braked Alfine, but pretty close. ...but only in stupidly small sizes, which is probably good otherwise I'd be very tempted! The Carrera Subway 8 has straight handlebars, and I think I'd prefer to go back to drops for my next commuter. I need to find someone selling a plausibly acceptable steel frame. Singular are a possibility, although they're mostly out of stock at the moment. The Ridgeback Nemesis looks to be pretty close to that perfect spec. It even comes with decent tyres. Specialised do a Globe with an 8-speed hub. This morning I saw 2 Trikidoos at different points near Clapham Common. One was escorting 2 children on bikes and had no passengers . Being pushed up Callas Hill (or Callous Hill, as iddu calls it) out of the village: a touring bike with a spare wheel* on each side of the rear rack! The rider - or pusher - looked like an old CTC type. I spotted a very upright Mission load trike in Elephant & Castle. Large rear low loadbed. Spotted a fairly well loaded Thorn, with a trailer (of the one-wheel, Bob Yak type) riding along Fenchurch Street at lunchtime today. I saw a classic LWB recumbent - probably a Peer Gynt - in Herne Hill near Brockwell Park. Saw a Pashley Governor at lunchtime today. The riding position looks every bit as ungainly as I thought it would. A tandem heading North at Tooting Bec last night at 12.45 AM ! They looked as though they had got started early for the Sunday run. It was a little surreal, I nearly crossed the road to see what sort it was and ask where they were going, but I thought they might think I was strange . Don't know if it's unusual enough for this thread but it's the first one I've seen. I saw and tried An Itera yesterday, it was the most flexible and horrible bike I've ever ridden . Interesting to see that they were popular in the West Indies for their relative rust proofness. I saw a Strida today near Borough High Street. I say 'saw', but I heard it first. Marvellous family-carrying Christiania bike locked up outside the local pool. Always makes me smile, in a place where nearly everyone else rolls up and deposits their kids out of increasingly large 4x4s. It's Bromley, ffs, not the Rockies. I saw a lovely gold Brian Rourke today, gorgeous old campag on it. It looked like it had originally been built up that way, rather than rebuilt with old stuff. Lovely lugs with heart shaped cutouts, but very long points on them. The only other ones I've seen like it are on my Bob Jackson. Today, King's Road - a mint Eddie Merckx, just like this, except with a black Brooks Swallow. Never really looked before but my LBS has a couple of Pashley tandems - one with Maguras and flat bars - and in the corner a dusty lugged Mercian in bronze with Weinmann sidepulls and perforated levers. Last Saturday in Chester a very purposeful and 'European' looking adult trike with electric assist and 406 wheels all round. A shaft driven bike by Danish bicycle makers Viva. This model seems to have been a special edition. Only 120 were made and this one was a little plaque stating that it was the 115th made. It's the 'A' train that runs between Køge and Copenhagen.. The Pompino's bottom backet is kaput, So I had to use the train / Bus to get to work and back.